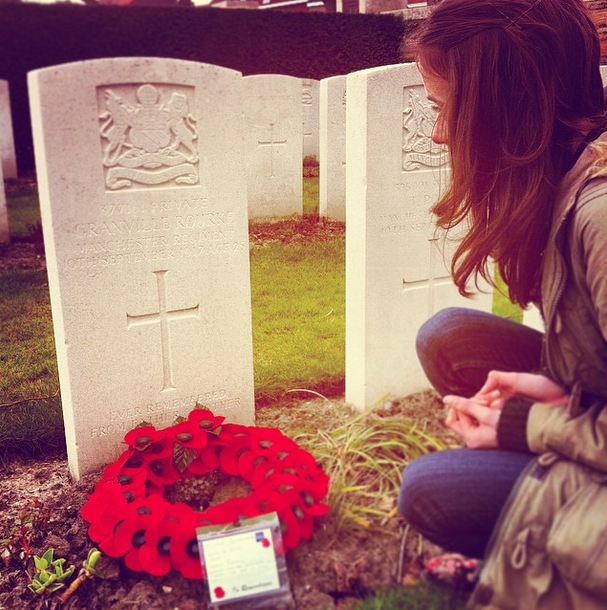 Charlotte Taylor, a 14-year old teenager, writes about her experiences whilst taking part in the First World War Centenary Battlefield Tours Programme. 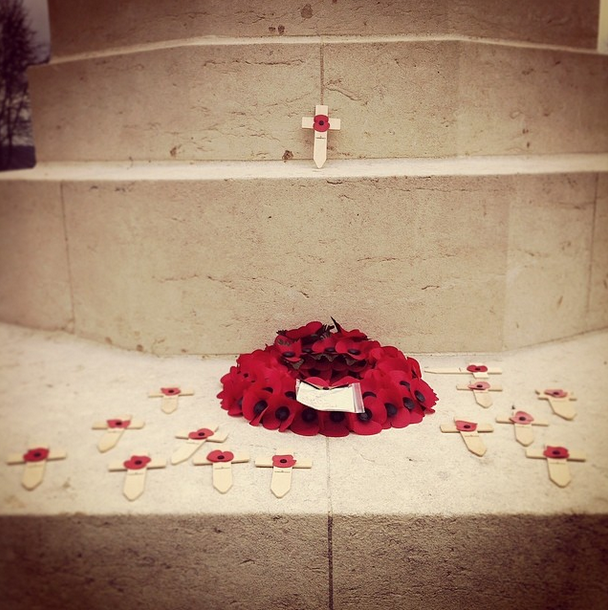 On 16th – 19th March 2014 a group of 30 students and 15 teachers from secondary schools across the Midlands took part in a four day First World War Centenary Battlefield Tours Programme in Belgium and France. We visited the battle sites and cemeteries of the First World War, learning more about its history and the people who fought and died in the war. This programme was designed to help students learn more about the Great War by giving them the experience of visiting the museums and cemeteries in which the soldiers and the battlefields that they fought upon are remembered. As one of the first group of students to be taken on this trip, the experience for me was quite extraordinary. Not only did I visit the museums and battle sites, I was able to share my experience with the new friends that I made, explore deeply about the history of the war, and truly empathise with the soldiers that fought, which you cannot do by simply reading from a text book. For me, this was a once-in-a-lifetime opportunity. On the first night of the tour, all of the students, along with their teachers, had a briefing session, which included a World War One overview and a tour briefing. Each group of teachers and students were given an iPad and set the task of researching some of the war dead on the Commonwealth War Graves Commission website. This website gives you the opportunity to find the name and place of commemoration of 1.7 million men and women in the Commonwealth forces that died in both World Wars, searching by a combination of criteria, such as surname, country of origin, date of death, the war they fought in, the field they served in, rank, regiment, etc. While doing this task, I entered my Nan’s maiden name, which is Rourke, and the place she’s from into the search criteria and came across a relative of mine, Private Granville Rourke, that I did not know about, who fought in the Great War, in the Third Battle of Ypres, and is buried in Ypres Town Cemetery Extension. In relation to me, he is my Great Great Uncle, and to find this information was quite a shock. Following this, the organisers spoke to me about an opportunity to lay a wreath as were visiting the cemetery where he had been buried. After this, I spoke to my family about my findings and they were all as shocked as I was and felt a range of emotions. The next day, I was given a brief explanation about what was going to happen when I visited my relative’s grave. At this point I was advised that, with both mine and my parents’ consent, I was going to be filmed and interviewed by Equity and the BBC for a short programme which was being aired in a few months time when the Centenary programme was officially launched. On the way to Ypres, the organisers who work for the Institute for Education had found out some more information about Granville, such as what day he died, what battalion he was in, how old he was, etc. After fighting with the Manchester regiment in the Third Battle of Ypres, he was injured on the 7th September 1917 and died three days later, aged only 25. When we arrived at the cemetery, I suddenly began to feel quite emotional, as I have never known about any relatives of mine from this time period, let alone ones who fought and died fighting for our country. Arriving at the cemetery I was given a wreath and was able to write a personal message explaining how I felt when I found him. My teacher and I were then asked to walk up to the grave and lay the wreath down. I sat by where he rested for a few minutes to pay my respects and to reflect upon our family and the war. After I visited his grave, we then went to the Ceremony of the Last Post at the Menin Gate in Ypres; this was very emotional especially after the visit to the cemetery earlier. The hour long ceremony takes place every evening and the main road is closed. This is in order to commemorate the soldiers who fought and died in the Great War. The ceremony began with ‘the Last Post’ and visitors were given the opportunity to pay their respects and lay a wreath. This was especially poignant whilst looking at the names on the memorial and knowing that this was main road that the soldiers, including my Great-Great Uncle, would have walked to go back to the front line. As we visited the battlefields and grave sites, we were able to learn about what the different symbols on the graves represented, what the meanings of the different memorials and statues are, and the background of some of the soldiers’ lives in the war. We learnt about the way people of different nationalities and religions were buried and how the gravestones differ. On the first day in Belgium, the first cemetery we visited was Tyne Cot, which is situated 9 km north-east of Ypres town centre. Tyne Cot Cemetery is the largest British and Commonwealth War Cemetery in the world: 11,954 soldiers are buried here, 8367 of which have no personal details and the Memorial to the Missing at the rear end of the cemetery holds 34,927 names. This cemetery is also the one that had a large impact on the group because of the sheer size of it. For me, this cemetery was so special because of the thoughtfulness and consideration given to how it was planned and presented. The grounds and gravestones are regularly maintained and it is set in beautiful surroundings which are calm and peaceful. However, at the same time seeing a picture beforehand does not prepare you for the emotions you feel when you see it first hand. It is very difficult to describe the emotions that I felt and even now I struggle to put them into words. One of the sites we visited was Langemark Cemetery, which is solely German. This cemetery was very moving because of the sheer number of people buried in one grave. Unlike other war grave sites, Langemark Cemetery is smaller than most of the other cemeteries with a limited amount of graves, but between 1-15 German soldiers are buried underneath each gravestone, with a large mass grave at the front which holds the bodies of almost 25,000 soldiers. I think this grave site was one of the sites that impacted the group the most because of how many people where actually buried in one small cemetery and you get a real sense that this was a cemetery for those who were defeated. Another very moving cemetery was Lijssenthoek Cemetery. This was the last cemetery we visited and we got to learn a bit more about the history of the site. I noticed that, in this cemetery in particular, there was a range of different religions and nationalities. One part of the site was in commemoration of the Chinese soldiers, another part for the German soldiers, and most of the site was for the British and Commonwealth soldiers. The graves in this cemetery record a large range of different religions.. My friend and I took some time going around the site and paying respects to the soldiers in different ways according to their religion or nationality, such as placing a stone on the Jewish graves, saying a small prayer to the Christian graves, etc. I think that this was a nice activity to do because it gave us a chance to understand more about the soldier and their religion and empathise with the soldiers’ families and how they pay their respects to loved ones. We also visited other grave sites for different nationalities, such as the Neuve Chapelle Indian Memorial, VC Corner Australian Cemetery and Memorial and Langemark Cemetery. The Neuve Chapelle Indian Memorial commemorates 4742 Indian soldiers with no known graves: two of these men were awarded with the Victoria Cross. The VC Corner Australian Cemetery and Memorial is the only wholly Australian cemetery in France and contains 410 unidentified bodies from the Battle of Fromelles, buried in two mass graves, marked with large concrete crosses, with a memorial which lists another 1,300 names. Along with the grave sites, we also visited some museums such as the Memorial Museum Passchendaele and ‘In Flanders Field’ Museum. The Memorial Museum Passchendaele is there in remembrance of the 500,000 casualties in the Battle of Passchendaele in 1917. This museum gives you a better perception of what the living conditions for the soldiers were like, by the way they have reconstructed the communication and dressing posts, headquarters and sleeping-accommodation, in a unique area known as the Dugout Experience. There is also an area known as the Trench Experience where visitors can see and walk through the network of British and German trenches. To be able to have this experience was extraordinary because it truly brought to life what I have read in text books and seen in films. The ‘In Flanders Field Museum’ is a very interactive museum which gives you a deeper understanding of the people who were affected by the war, including the Allied and German soldiers and the Belgian civilians. This museum is very impressive and gives you the opportunity to see artefacts from the war and understand the perspective of different people in the war. Since the trip, my mum and I have been doing some further research about Granville Rourke and we found that we also have another relative who fought and died in the Great War: my Great-Great Granddad, James Wentworth Taylor Rourke. This information also proved to be quite a shock for the family as we have since found some photos of his Battalion, the Lancashire Fusiliers, in which we believe he features. Finding out all this information about relatives that we previously knew nothing about has given us a stronger connection to the war. 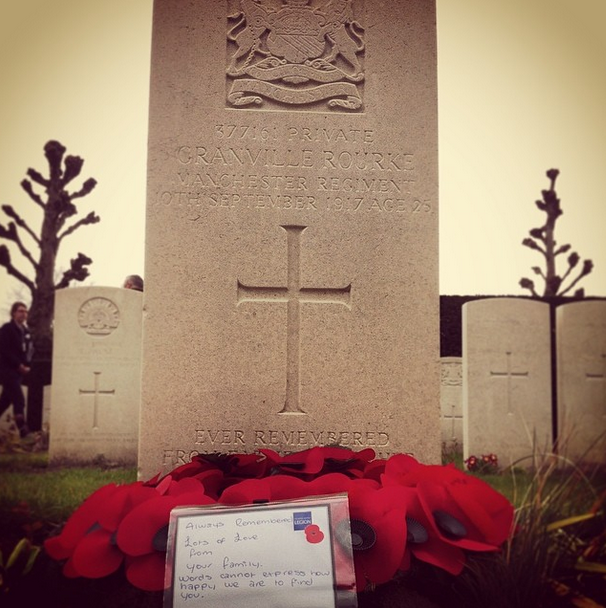 I am so thankful to be given this opportunity which has enabled me to see another side of the First World War. A wonderful piece, thank you. God bless Granville and James. This is such moving story - well done, Charlotte. My wife and I, along with six other family members visited her grandfathers grave in Brandhoet cemetery near Ypres some eight years ago. We all experienced the same feelings as Charlotte during the visit and our tour of the other cemeteries. Her writing of this story has restored my faith in our young people. Well done, Charlotte. I came across this article by accident. Granville Rourke was my husband's uncle. We'd love to hear about your connection to him. What was your nan's name?